Hmmmm, I figure if I am going to blog about music any topic should be fair game. And since my IPod has just about 7,000 songs from rock, metal, classical, pop, Latin to avant garde and everything in between, why not leave the subject matter to chance? Not sure about you but I am a shuffler! I rarely listen to albums all the way through. I like to hit the shuffle button and let the bon temps roule! Of course if something comes up I am not in the mood for I can always forward to the next song. Rocking out to Led Zeppelin and then getting thrust into an early Baroque organ ricercar doesn’t always vibe…although there are times when my ears are wide open and they go together like chocolate and peanut butter. I’ve been thinking why not hit shuffle on the ol’ MP3 player and whatever comes up will be the inspiration for a post. Like I said earlier I should be able to come up with something interesting from any piece of music no matter the genre. So here it is the first entry in my IPod shuffle series and I got an easy one, “Toys in the Attic,” the title track from Aerosmith’s classic1975 album. “Toys” featured two of Aerosmith’s mega hits “Walk this Way” and “Sweet Emotion” both radio and pop culture staples since the day they hit the scene. Even as little kids we knew these songs. I have to admit that for a brief period I actually thought the album was called ‘Toys-amatic.’ If you don’t know, the phrase toys in the attic, is a reference to someone who might not have everything going on upstairs…a little nutty…insane! 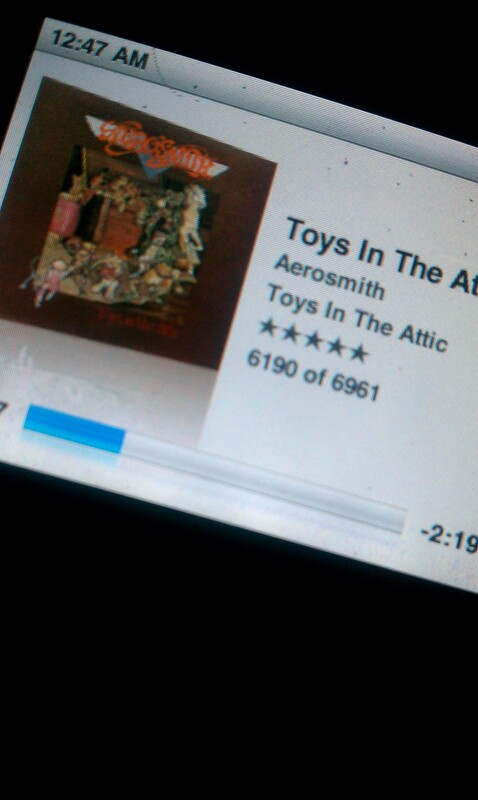 Not so much related to the comically ironic picture on the album cover featuring…toys….in an attic. Of course having to prove my twelve year old manhood I told him I knew all about Aerosmith and to save face proceeded to give them a listen. Amazingly the music opened a revolution on that twelve year old kid! I could not get enough hard rock after that. Aerosmith led to Zeppelin to AC/DC to the life changer…Van Halen!! Once I heard Eddie Van Halen play guitar, I knew that was what I wanted to do the rest of my life! Here I am 30 years later with two degrees in classical music and a career as a guitarist! Socially, being a rocker, led to the friends I made in school which led to some life long best friends I’ve had up to this day! Who knows where my life would have gone if I didn’t jump the New Wave ship to a life as a rocker kid turned classical/jazz/flamenco guitarist. Maybe I would have been the keyboardist in a Flock of Seagulls cover band. Thank you Aerosmith!